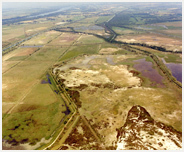 « Les Amis des Marais du Vigueirat » (AMV), current manager of the Vigueirat Marshes, is a non-profit organization governed by the law of 1 July 1901 and the decree of August 16, 1901. The association was created in 2001 following the judgement of the management by the Sansouïre Foundation. reduce the environmental impact of the activities on the air, water, soil. bring the people involved in the site and its future together. Beyond their first and main task of protection of nature, the AMV are intended to take into account human actvities for an integrated land management. These include integrating the site in the economic and social network and by extension to generate economic activities and jobs around sustainable tourism complementary with hunting and farming, to worry about social thematics (professional integration, social links), and cultural (environmental education, events, fun….). The action of the AMV for local socio-economic development rooted in Mas-Thibert, commune of Arles, 20 km from the city center, and also extends more broadly on the territory of Plan-du-Bourg between the communes of Arles, Saint-Martin de Crau and Port-Saint-Louis du Rhône, and ultimately throughout the Regional Park of the Camargue, so that all the residents and the local rural population can benefit from proposed actions to develop the territory.